Caption slip reads: "Photographer: Gaze. Date: 1957-08-19. Reporter: Gaze. Assignment: Charles Guy and father. 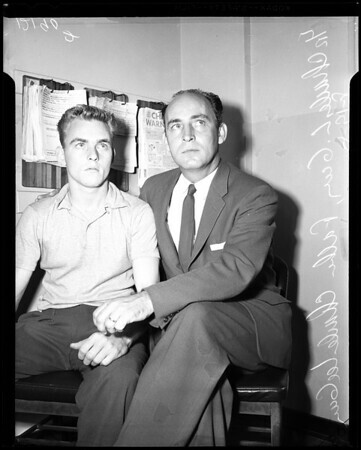 #79-80: L to R: Charles L. Guy, 19, is greeted by his father, Charles Lee Guy, county prosecutor, of Dunn, North Carolina, who is here to help defend his son, charged with the murder of Guy Roberts, 45. The latter was to marry young Guy's mother tomorrow (Wednesday)".